Here's a bleak tech fact to kick off your week: You will never, ever, ever see every planet in No Man's Sky. 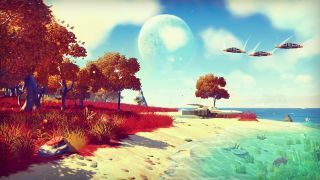 That's because there are 18,446,744,073,709,551,616 of them, and Hello Games co-founder Sean Murray told IGN that it would take you around 5 billion years if you wanted to visit them all for just one second each. That's exactly why the team is having to send bots to take and return photos of the game's many, many far-flung worlds. And even if scientists discover a live-forever drug in our lifetime, it's estimated that our sun only has 4.6 billion years of life left in it. So yeah, you've already failed at this game.